A new report can be built using the Report Builder, located in the Report Tool drop down menu found within your TIM account’s Main Menu. This page guides you through the steps for creating a new report. Note that the Report Tool displays only published data. TUPS surveys must be “Submitted” to be included in reporting. TUPS surveys that are still “In Progress” will not be included. TIM-O, TIM-R, and TIM-LP records must have the status of “Published” to be included in reporting. Records with the status of “Not Published” will not be included. Figure 1. The Report Builder home page. When creating a new report, first name the report by using the Title text box. Figure 2. Entering a title for the report. This option allows you to select the type of report you wish to create. When you click on the Type dropdown, you’ll be able to choose a TIM-LP, TIM-O, TIM-R, or a TUPS report. Figure 3. Selecting TUPS from the type of report dropdown menu. The Visibility dropdown enables you to set who can see the report. Your choices are “Me Only” (yourself), “All Members,” or any of the member roles or combination of roles. Use the Control key (WIN) or the Command key (MAC) to select more than one role. Figure 4. Visibility dropdown menu with District Observers and District Leaders selected as the audience. The Schools dropdown menu gives you the ability to select which school you would like to be included in the report. You can select a specific school within your district, or set it to “All District Schools” so that every school is incorporated in the report. Figure 5. Schools dropdown menu as seen by a district leader. 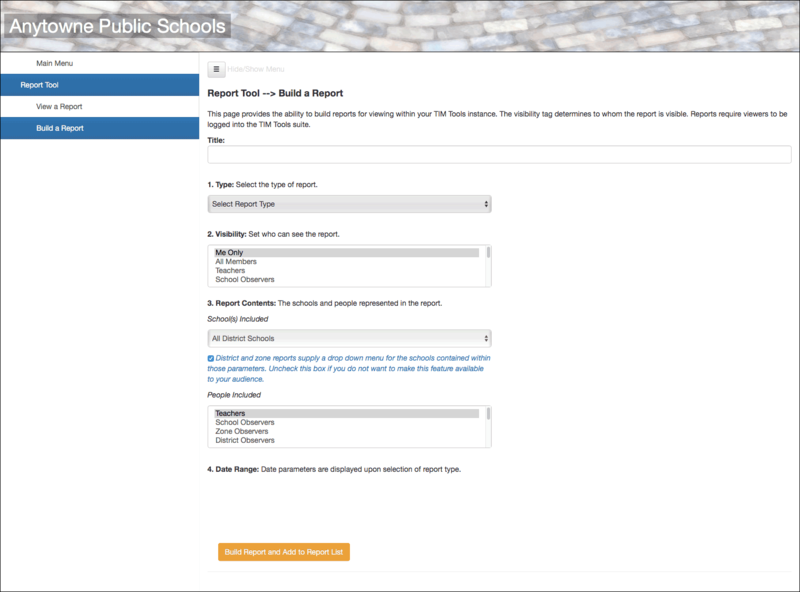 School leaders will be able to create reports for their school. Zone leaders will be able to reports for their zone or any school within their zone. District leaders will be able to create reports for the entire district or any zone within their district. If “Individual Member’s Results” is selected from the Report Contents dropdown menu, then report viewers will see only their own personal results. If “Individual Member’s School” is selected, then report viewers will see only the aggregated results for their own school. By default, district and zone reports include a dropdown menu that disaggregates the data by school. Uncheck the option box if you do not want data disaggregated by school available to the report’s audience. Figure 6. Unchecking this box will not allow viewers of district or zone reports to view individual school data. The People Included dropdown menu allows you to select which roles you want included in the report. Typically, you will want this set to Teachers. If you have assigned some classroom teachers as School Observers, then you should also select School Observers to capture the entire teaching faculty. Any role or combination of roles can be selected. There is also an option for All Members. Figure 7. Selecting which roles to be included in the report. The Date Range is the final section before completing your report. Once you’ve selected the type of report you wish to create, the date range of available data for the selected report type will appear at the bottom of the screen. You can choose to leave the entire range selected or narrow the date range to include just a slice of the available time frame in your report. If you select an End Date in the future, the report will be updated with newly-added data each time the report is viewed. Figure 8. Date range selector narrowed to the fall semester. Once you’ve set all your Report preferences, click on the Build Report and Add to Report List button. Your report will then be added to the Report List and will be visible to whomever you specified in the Visibility setting. If you wish, you can allow members in the system to see all of their own data using the Report Tool. This can include the TUPS and Reflections that the teacher has created as well as any Observations of teacher’s lessons or Reviews of the teacher’s lesson plans. Simply create a report for each of the tools (TUPS, TIM-O, TIM-R, or TIM-LP) you are actively using. Set Visibility to “All Members,” set Report Contents to “Individual Member’s Results,” and set People Included to “All Members.” If you want members to see new results on an ongoing basis, change the End Date to a point in the future. The resulting report will be available to every member, but each member viewing the report will see only his or her own data. If you created reports during the 2017-2018 school year with the beta version of the Report Tool in TIM Tools 5, your legacy reports will still be available in TIM Tools 6. If you edit a legacy report, it will be saved as a version 6 report. The current Report Tool has much more flexibility regarding roles than the beta version had.